Major Mike Peters is the author of Glider Pilots at Arnhem (co-written with Luuk Buist) and Glider Pilots in Sicily, a serving AAC Officer, has also published DVD's on the history of GPR and Pegasus Bridge and leads battlefield tours (where does he find the time?). 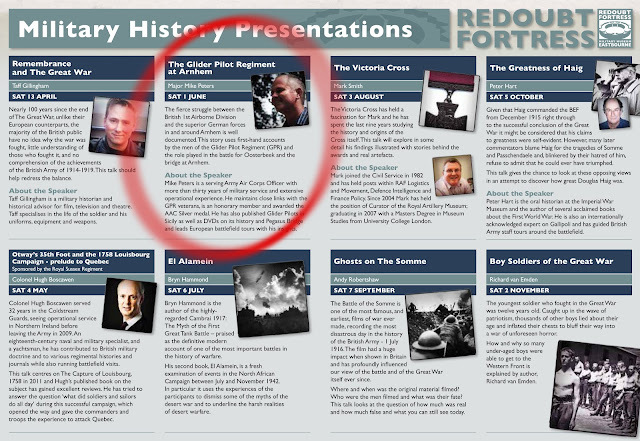 On Saturday June 1st, Mike will be giving a lecture on 'The Glider Pilot Regiment at Arnhem' at the Redoubt Fortress in Eastbourne. If you'd like to attend please call 01323 410300 or visit www.eastbournemuseums for more details. Lectures run from 2pm to 4pm with a short Q&A session afterwards.